Dr.B.R.Ambedkar Open University issued the MEd/ BEd/ BEd(SE) Entrance Test notification in this year and online applications were invited through its University BRAOUONLINE Web Portal from eligible and interested candidates. This Entrance test for admission into M.Ed., B.Ed., B.Ed. (Special Education) Programmes in its study centres. Eligible candidates were applied for this admission stream. MEd/ BEd/ BEd(SE) applied candidates are waiting for their hall tickets. 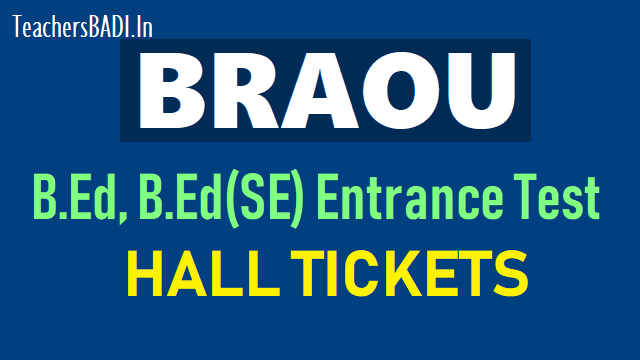 BRAOU Officials have uploaded MEd/ BEd/ BEd(SE) Entrance Test Hall Tickets 2018 on its Official web portal BRAOUONLINE.IN. Candidates can download their Entrance Test Hall Ticket from above mentioned web portal. Dr. B. R. Ambedkar Open University (Dr.BRAOU), initially known as Andhra Pradesh Open University, was set up on 26th August 1982 through an Act of the Andhra Pradesh State Legislature (APOU Act 1982). Subsequently, the university was renamed as Dr. B.R. Ambedkar Open University, on 26th October 1991. This University, the first of its kind in India, is the ninth (9th) largest university in the world in terms of number of students, the first being IGNOU (EENADU 21-06-2010). All the programs offered by the university are recognized by the Distance Education Council (DEC), IGNOU, New Delhi.